Located 20 minutes from downtown Blue Ridge, GA, Serenity is what awaits you in the seclusion of this cozy two bedroom, two bath log cabin which which sits on a 2 1/2 acre tract and overlooks Prince Mountain for an exceptional mountain view. "Serenity" is what awaits you in the seclusion of this cozy two bedroom, two bath log cabin which which sits on a 2 1/2 acre tract and overlooks Prince Mountain for an exceptional mountain view. This cabin does require 4WD. Both bedrooms are equipped with king size beds for your comfort. The master bedroom is on the upper level and has a jetted garden tub and a private sitting area where you can look out at the beautiful North Georgia Mountains! The cabin has SAT TV, DVD, WiFi, wood burning fireplace, fully equipped kitchen, and a gas grill for outdoor cooking. The hot tub is on the side deck and has the perfect view. On the covered deck you will find rocking chairs, wicker furniture, and a hammock for your enjoyment. At the entrance of the cabin there is a beautifully landscaped area with a fire ring with removable grate for cooking over the open flame or just enjoying a campfire. There is an abundance of wildlife around the cabin. 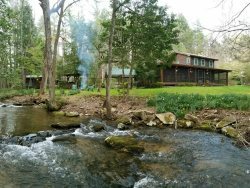 This is a perfect place for a romantic getaway or if you are just looking to be surrounded by nature at it's best --- Serenity is exactly what you are looking for and pets are welcome! All of our cabins include linens, dishes, pots, pans, towels, washcloths, etc... We will provide an initial supply of guest soaps, toilet paper, dishwasher detergent, paper towels and trash bags. For an extended stay we suggest you bring a supply of toilet paper, paper towels, laundry detergent, and starter logs for wood burning fireplaces. It was a great place to stay for the weekend and loved the view and just loved all of it!! We has such a relaxing stay at Serenity cabin. It was clean and there was no bugs. Thank you for sharing your cabin with us! The cabin was great, well furnished and decorated. Everything worked and beds were comfortable. Excellent stay. We will be back. Cabin was as expected and secluded! Beautiful view and forest scenery! We had a wonderful time with our family and the cabin was great. The rooms were fantastic and the bathrooms were clean. The views were amazing and so nice and quiet. Thanks for everything. We'll be back! We did everything online but we were very impressed with the call we received the day before arrival letting us know we could check in early. That's awesome guest service. The property exceeded our expectations! We love the large bathrooms and the cleanliness of everything. The view is amazing even from the jacuzzi. Having the firewood covered and ready for us was also great! Overall a WONDERFUL weekend getaway that I would recommend to anyone!!! Everyone was very nice and very helpful. We worked with several people - online and by phone - and everything went as planned. Thank you! The cabin was clean and ready when we arrived. I especially liked the key-less entry, all the hooks on the wall in the downstairs restroom for towels and swimsuits and the dry firewood. The kitchen was well stocked although I would have liked some plastic ware for using around the hot tub. The hot tub was clean and hot when we arrived but the headrests kept popping off. We didn't use the fireplace but did enjoy a fire outside in the fire pit. The staff (by phone and online) were very helpful and we didn't have any problems during our three day stay. Easy transaction . no hassle to pick up the keys and directions. It was a wonderful weekend get away to celebrate our 38th anniversary. Nice cozy place and quite secluded . Well off the beaten path.